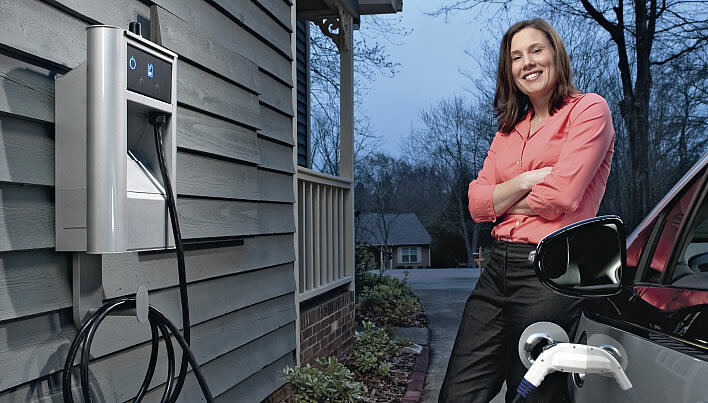 I’m accountable for the plug-in electric vehicle (PEV) readiness program at Duke Energy. My organization oversees efforts to prepare for widespread customer adoption of electric vehicles. These efforts include pilot programs with our customers, as well as internal studies to determine potential impacts on the power grid. Through our pilot programs, the company is learning about the technical aspects of PEV charging stations, and what we can expect from the charging behaviors of customers. As part of our Carolinas-based pilot, Charge|Carolinas, we are installing 150 “intelligent” charging stations in customers’ homes at little or no cost to them. These stations will enable us to wirelessly access a wealth of charging data, including power usage, the time of day customers charge their vehicles and charging frequency. Our Project Plug-IN pilot in Indiana includes the installation of charging stations in both residential and commercial locations — a total of 125 are planned. With these two pilots, we believe we will own the largest number of charging stations of any North American electric utility. From the knowledge we gain, Duke Energy can better meet our customers’ needs and expectations. The environment will also benefit as PEVs are more widely adopted, due to decreased emissions. Even in regions where most electricity is produced by coal, PEVs reduce greenhouse gases by 25 to 30 percent over conventional vehicles (source: GoElectricDrive.com). And considering today’s high gasoline prices, our customers will save at the gas pump and help reduce U.S. dependence on foreign oil. As PEVs become a practical transportation option, I’m committed to making sure they will be plugging into a power grid that remains affordable, reliable and safe. To learn more about the benefits of PEVs, visit duke-energy.com/plugin.